This recipe yields, without a doubt in my mind, the BEST chocolate brownies I have ever eaten. The base is a rich dark chocolate that is thick, sweet and chewy. The chocolate cream cheese frosting is just that - icing on the cake. Smooth, creamy and rich with dark cocoa powder. This combo is a winner! 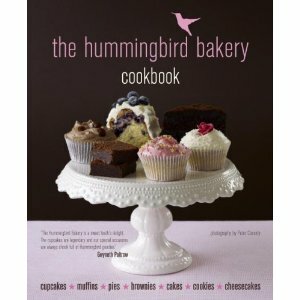 Thank-you, Hummingbird Bakery, for another amazing recipe. Every one I have tried so far from their gorgeous cookbook has been a huge success. This one is no different. If you don't own this cookbook yet then you have no idea what you are missing. It is loaded with recipes for pies, cakes, cookies, muffins and brownies. I simply adore it. **NOTE: I left the brownies in the pan and cut out squares straight from there. To store, just cover with clingwrap and place in refrigerator. These are even better the next day! Get ready for Friday, June 20, 2012 !!!! In honor of The Queen's Diamond Jubilee Year and the London 2012 Olympics I am giving away a copy of this gorgeous cookbook to one lucky winner. 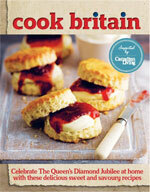 It is jam-packed with recipes from England, Scotland and Ireland. Mouthwatering from start to finish. Giveaway will open this Friday morning and entries will only be accepted for 5 days before the contest closes. As always, this giveaway is open to all my followers worldwide. Is this recipe easy to convert to nonmetric? Thank you! I highly recommend bakers weigh their ingredients vs measure them out. It just far more exact and results in better baking ! Do you know the nutritional infor for this receipe? Calories/Fat/Carbs/Protein/Etc? Thanks so much? I can't wait to try these!! Looks dark and chocolatey! I sure hope to get a copy of the cookbook too. I am sure there will be really amazing recipes to try in there. I have yumgoggle already bookmarked. Gorgeous site !!! Looks delicious! More chocolate more better! Wow, they look insanely fudgy! Perfect brownies. I am drooling all over these brownies, they are awesome! Hope you are having a great summer week end and thank you so much for sharing with Full Plate Thursday. These brownies sound amazing! I'm a new follower from the Something Swanky link party. the brownie batter part calls to add flour in twice but not sugar, though sugar is listed in the ingredients list? I make these brownies all the time but was wondering if u had any revised cooking times if I was to make these individually as in a muffin tin in cake cases. ωhy thiѕ twist of fate didn't happened earlier! I bookmarked it.